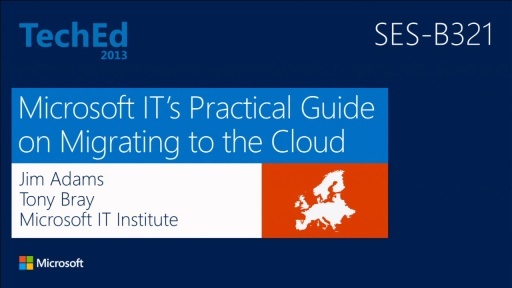 In this session, you are introduced to how Microsoft is moving its core business functions to the cloud. Microsoft IT Subject-Matter-Experts discuss the internal efforts at Microsoft with the objective of sharing critical lessons learned in our journey in the cloud, with emphasis on the following: 1) Our strategic vision and roadmap. 2) The organizational, business, and cultural hurdles we face; and the steps we are taking to overcome those hurdles while providing critical business support to our 189,000 internal users across 100+ countries globally. 3) Real-world case studies highlighting key architectural decisions we implemented as we moved our application portfolio to Windows Azure, and implement Microsoft Office 365, including SharePoint Online. 4) The inherent benefits we have reaped thus far, lessons learned, and recommended best practices from our efforts to date. After attending this session, you'll walk away with an understanding of the Microsoft vision and roadmap for moving to the cloud, the approaches we have taken to secure broad commitment, how we have overcome business and technical challenges, and our key lessons learned.